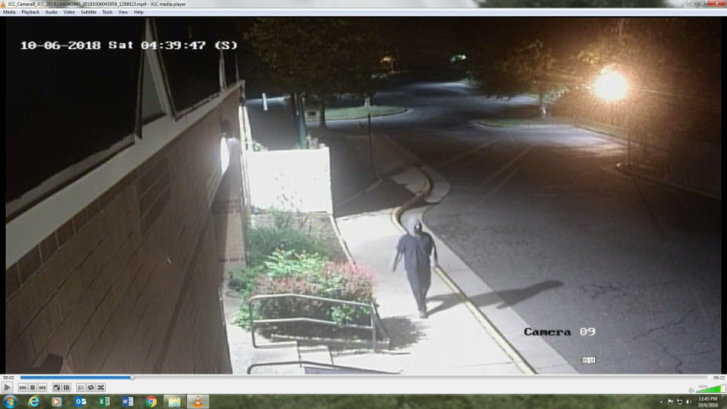 WASHINGTON — Fairfax County police are investigating swastikas that were spray painted on the front of the Jewish Community Center of Northern Virginia in Annandale early Saturday morning. Building staff noticed the vandalism, 19 swastikas in total, shortly after 7 a.m. as they were opening up the building for the day, said David Yaffe, president of the board of directors of the community center. Surveillance video captured a suspect spray-painting the building around 4:30 a.m. Detectives are reviewing the evidence and are working to identify the suspect. According to a news release from the center, police were called immediately after discovering the incident. Yaffe said this is the second time the building has been vandalized recently. In April of last year, swastikas covered the front of the building. Down the road, Little River Church of Christ was also vandalized. I’m just sickened and heartbroken. Not the first time. This building was tagged with Nazi “SS” lightning bolts recently. But this beats all. Anyone with information is asked to call police at 703-256-8035. Anyone who wishes to remain anonymous can submit tips through Crime Solvers by calling 1-866-411-8477, texting “TIP187” plus the message to 274637 or by submitting a tip online. There is a cash reward of $100 to $1,000 for those with information that leads to an arrest.